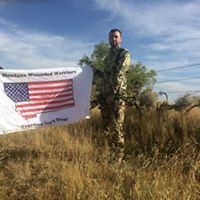 Montana Wounded Warriors had the privilege to be contacted and given permission to bring any of our Wounded Warriors that had drawn a special draw archery 410 elk tag to hunt on their land. 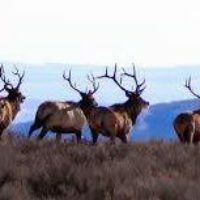 We went and met the awesome landowners and they took us around and scouted out several bull elk for us. 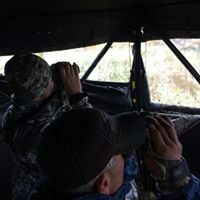 It was a great day meeting the ranch owners but now we had to get busy setting up a blind and get the Wounded Warriors who had tags for this area. It didn’t take long to find two Wounded Warriors, Mike Bossen and Chad Kiernan, who had the tags and the excitement to accept this opportunity. We had the plan and gear set up and the Warriors were geared to go and then perfect conditions turned into weeks of rain. We decided to tough it out and we sat in the blind for hours and watched over a dozen nice bull elk just stay a half mile away from us and the water hole. After a day of not getting the elk to come in, we went on a stalk. 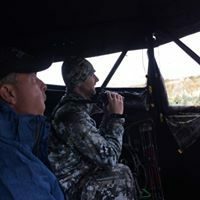 Chad and Mike went around the back side of the hill where the elk were and before they could even get to the elk, they spotted another bull bedded down within range of them. They moved in on the bull and Chad was setting up to shot when the bull stood up to take off and Chad released his arrow to hit the bull. We tracked the bull for miles with very little blood and never did find him in the huge amount of country. The Warriors were crushed but we wanted to head back to the blind to set up for an evening hunt. As we returned to the blind, we noticed that our decoy and blind had been racked with mud and elk tracks. So while we were out stalking, the elk had made their way into the water hole and vandalized our blind and decoy. It was a tough hunt, and we were just not in the right place at the right time, but boy did we have fun. We had a great group of Warriors and we sure were grateful for the landowner’s permission to hunt and for Dan and Marcie Ahlgen for allowing us to stay in their guest house for this trip. We did not get an elk, but the Warriors had a great time and we met some proud supporters of our soldiers.